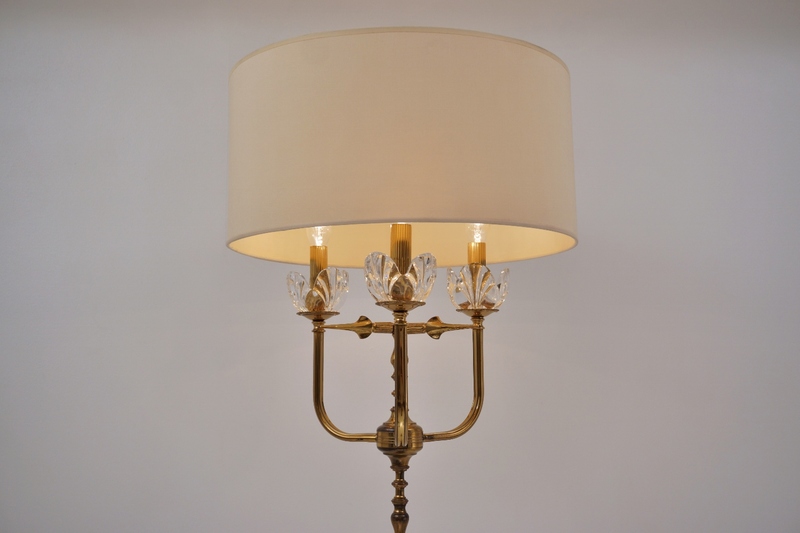 Maison Charles floor lamp (attributed), brass & `Lalique-style` crystal iris flowers,1940`s ca, French. This floor lamp has been gently cleaned while respecting the vintage patina. Newly rewired & earthed with gold tone silk cable & new black plug. It is fully working and PAT tested by an electrician. Light bulbs included. It is possible to use this light in other countries although it may be necessary to purchase different light bulbs suitable to local electricity. 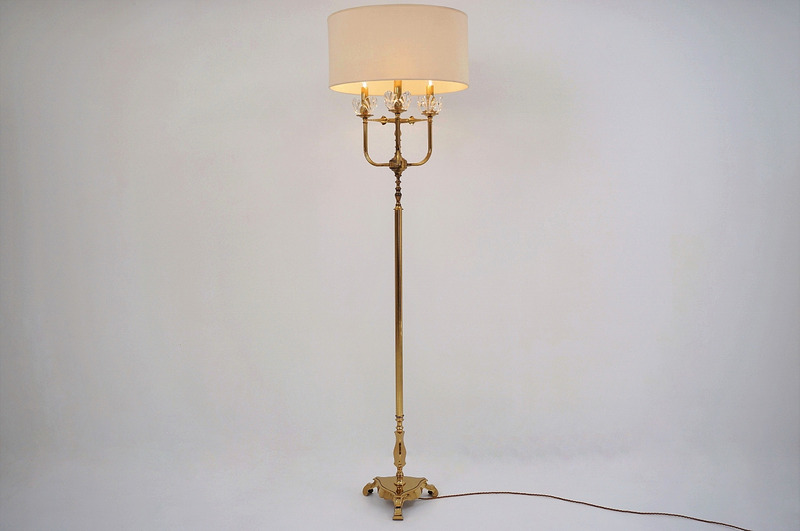 This vintage floor lamp was probably made by French Company Maison Charles, the attributed designer, as it has many of the distinctive design features: a combination of Regency & Neoclassical style, elegant proportions, luxury materials & quality casting. 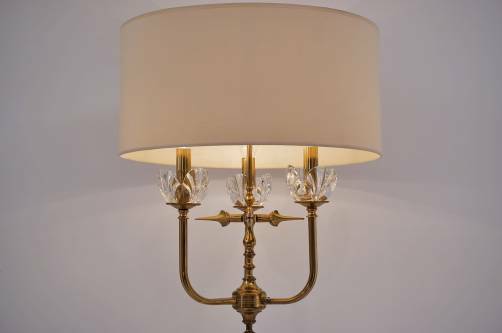 With the luxurious materials & sculptural presence, these lamp would suit a range of interiors such as Antique, Traditional, Hollywood Regency, Post Modern, Industrial or Contemporary. This piece is in keeping with Maison Charles’ quality and attention to detail. 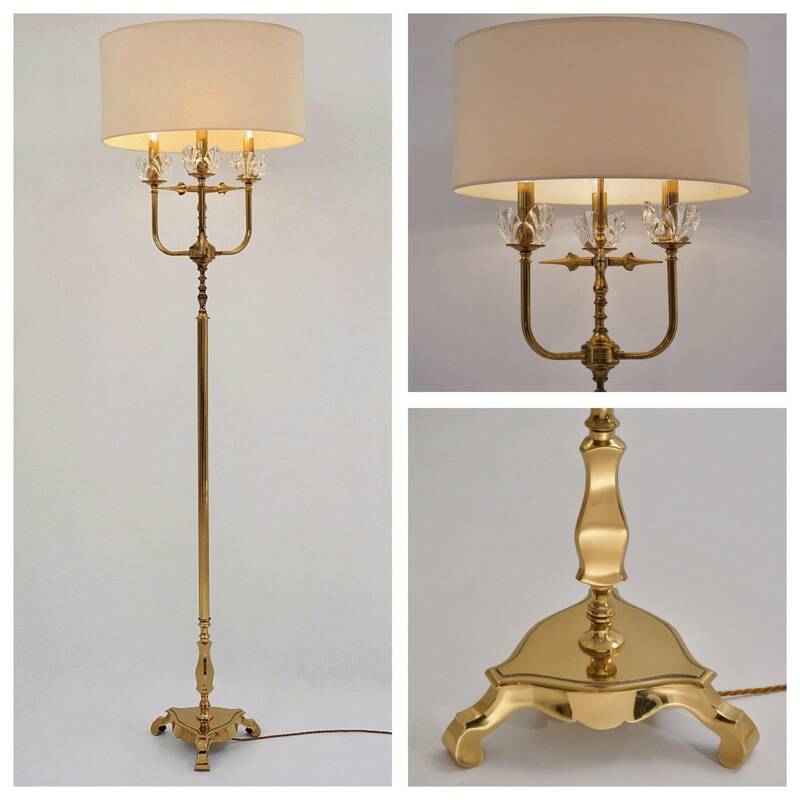 The design consists of a quality baluster or spindle cast solid brass base with beautiful age patina, on elegant scalloped brass legs. 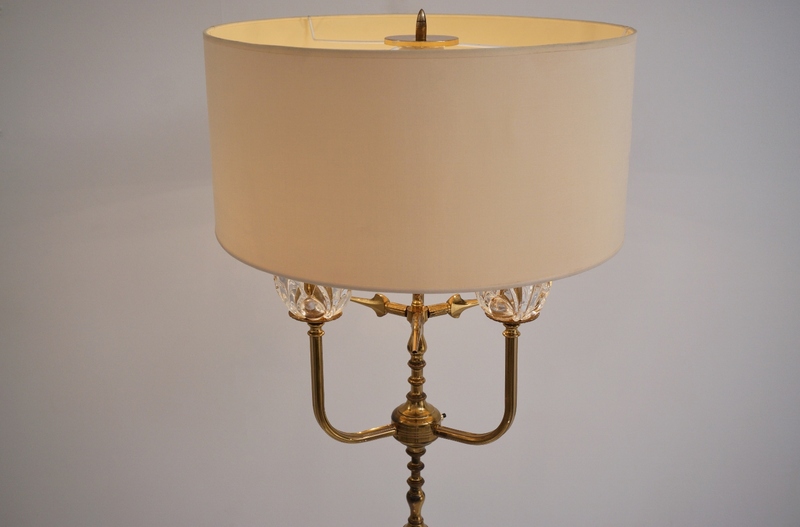 At the centre of the frame there is a brass cluster body with a brass canopy switch. 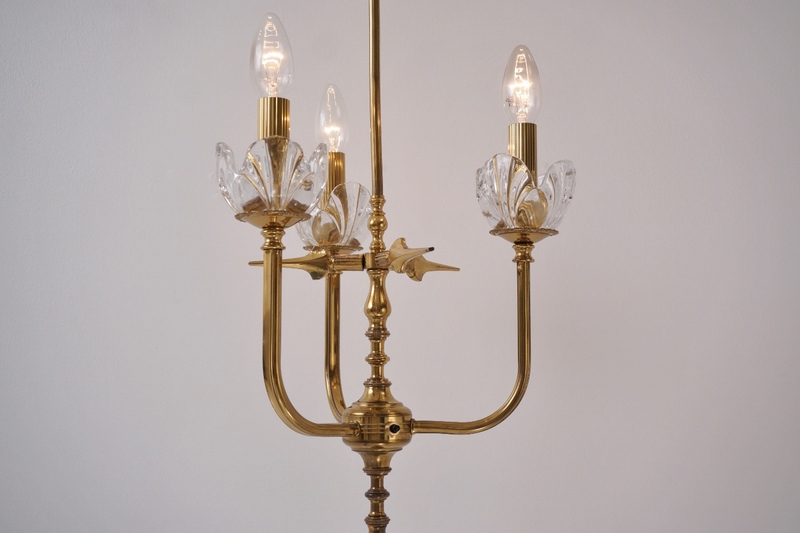 From this centre spreads out & upwards 3 brass tubular arms, in a candelabra like shape. Each arm finishes at the end with a lamp holder, covered by a removable solid brass candle cover patterned with textured vertical fluting. 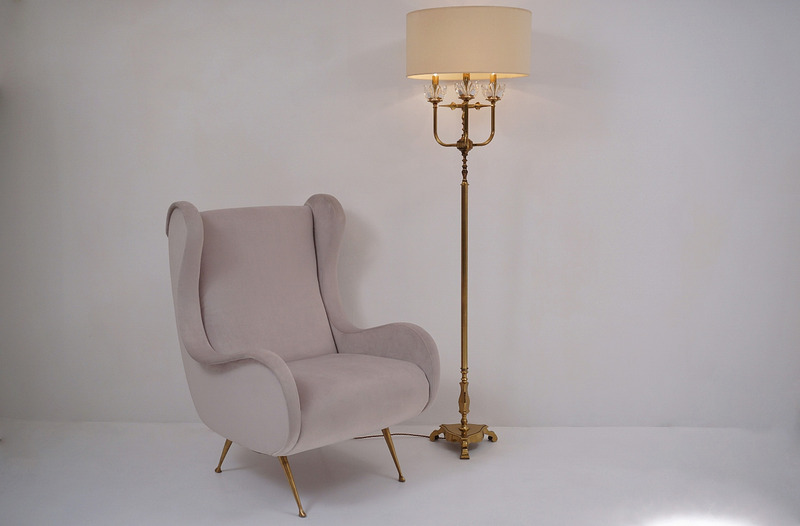 The lamp holders sit on a brass bobeche with a decorative pressed foliage pattern. At the top of each brass bobeche, sliding along the candle covers, there is a removable `Lalique-style` clear crystal dish with a detailed Iris motif. The centre portion of the frame has an additional sculptural portion where there are 3 decorative horizontal brass arrows that create a focus point and balance the composition. The main vertical column continues upwards in a fluted thinner tubular section, supporting the shade at the top of the frame. 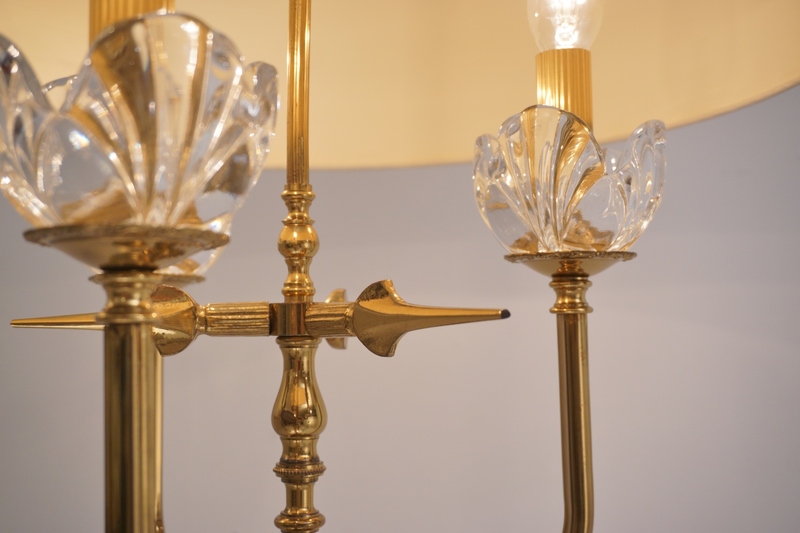 There is a decorative solid brass finial & polished brass washer to screw the shade in place. 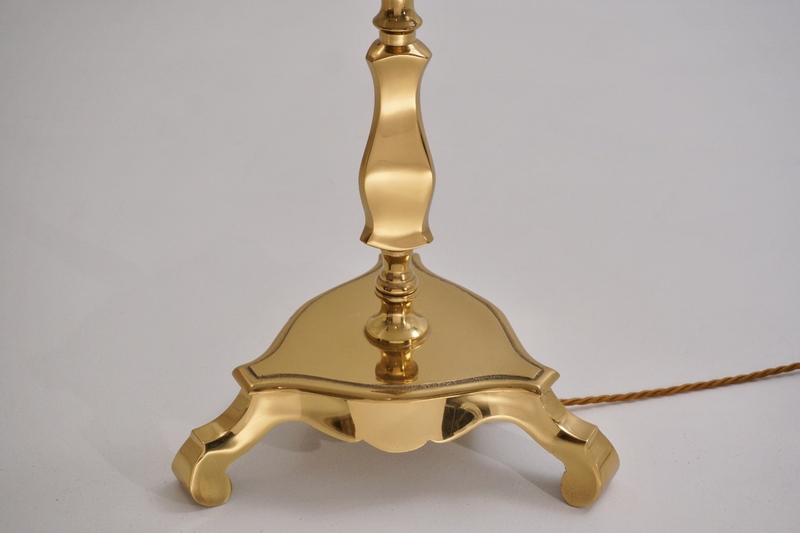 Towards the bottom end of the lamp, on the main brass column, there is a scalloped decoration leading to a triangular solid brass base with scalloped sides & feet. The base is weighted and makes the lamp very stable. The overall result is a naturalistic piece which is elegant & decorative. A vintage drum shade in beige silk fabric complement the design, and is probably of later date. 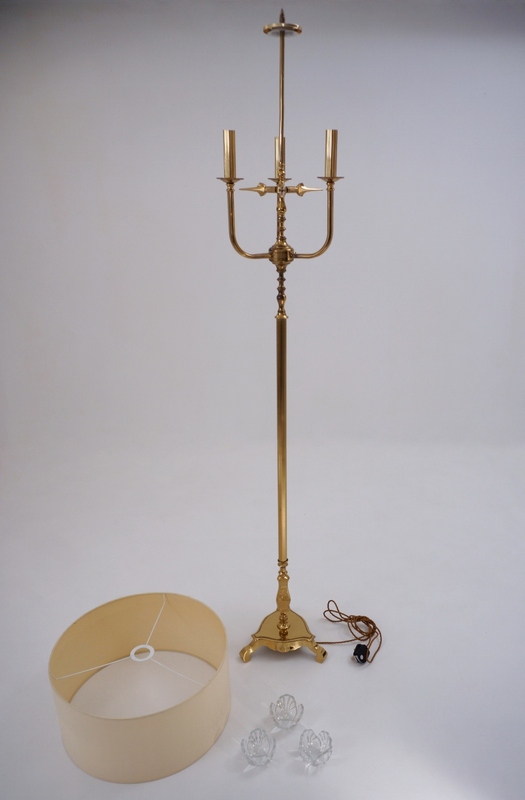 This floor lamp carries 3 standard small screw light bulbs E 14 up to 40 Watts each. At present fitted & photographed with Candle Clear shaped light bulbs of 25 Watts, which are included in the price. 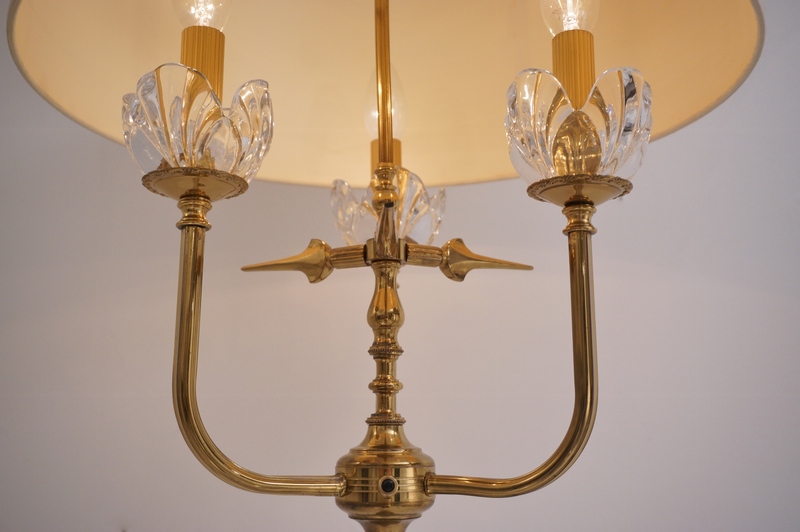 This vintage lamp is in very good condition. 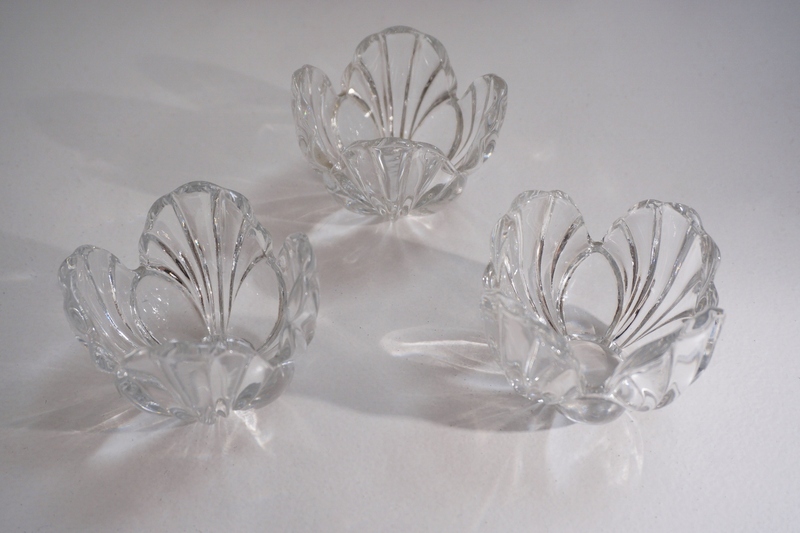 The 3 crystal shades are in excellent condition with no chips or cracks. The frame is sound. The solid brass surfaces have the original clear lacquer present, with a nice patina in line with age adding character. There is minor tiny bending of the vertical top portion of the frame in line with age & wear. The shade is good quality and in good condition, with some rubbing & tiny marks in line with age & wear. Packing is offered free of charge. We take special professional care while packing. For safe transport the drum shade & glass shades would be wrapped separately in bubble wrap and an outer layer of card. The base would also be wrapped separately in bubble wrap and an outer layer of card. Together these pieces would be boxed, safe for posting or shipping with a courier. 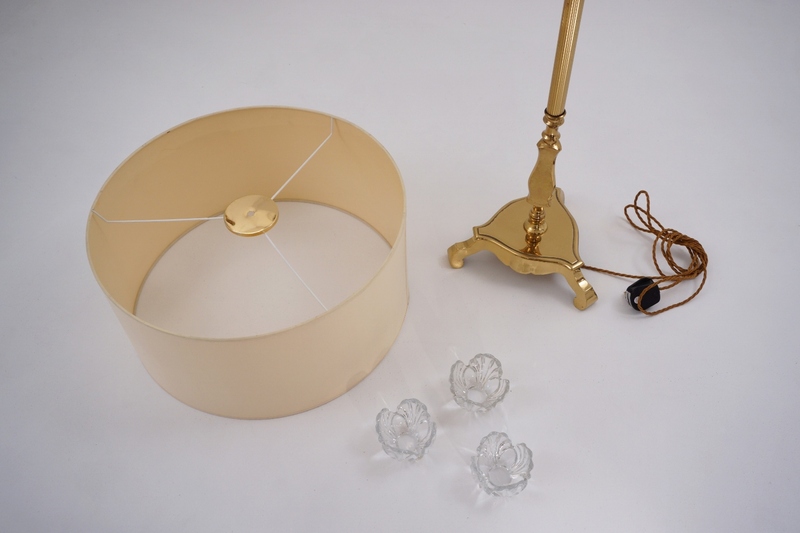 The dimensions of the lamp shade only: Height: 22 cm, Diameter: 45.5 cm. Maison Charles Lighting was founded in 1908 by Ernest Charles and is still in operation today. Read more on our Roomscape Blog about Maison Charles Luminaires.